Springfield could soon be joining the ranks of Melbourne and San Francisco, with the possibility for light rail on the table. Transport options to ease congestion and parking issues in the rapidly expanding community are being reviewed. Springfield Land Corporation marketing director Naren Sinnathamby said he had met with business owners impacted by the Gold Coast light rail system to ensure that if it were to go ahead in his community, it would be a positive step. “It requires a lot of consideration and planning and because I’m not a town planner I wouldn’t know the logistics besides you need to tear up roads,” Mr Sinnathamby said. He said services such as a shuttle bus would be considered as an alternative. “You would need to sit down and find exactly what the costing is as opposed to a traditional shuttle service, which wouldn’t cost as much. RAIL Back on Track spokesman Robert Dow isn’t sure Springfield would be the right fit for light rail. While Rail Back on Track spokesman Robert Dow said he is supportive of light rail, he does not believe Springfield will not reach the density required for it to be a success. He instead suggested electric buses could be a viable option for the area. “I hear what people are saying but a more likely outcome is the use of electric buses on more dedicated road priority,” Mr Dow said. Electric buses can be recharged in the time it takes for passengers to exit the vehicle and are popular overseas. Councillor David Morrison (Division 1) was supportive of having some kind of shuttle service around the CBD, whether bus or tram. Mr Sinnathamby said if the right model could be created, they could begin “sooner rather than later”, but it could take years. Light rail in Springfield could potentially function as a shuttle service between a number of areas that receive the highest amount of foot traffic. How about a sensible BUS service first? There are places in SEQ where light rail feeding into the QR system would work really well. This isn't one of them. Parking woes are caused by people coming from the suburbs being forced to drive due to inadequate feeder buses and urban road layout (windy, circular roads with many inaccessible by PT). Fix the feeder bus frequency first before you start pouring concrete! Oh dear, it looks like they only thought of transport planning just now. It's not going to support LRT, the road layout is too inefficient. That cannot be changed because the layout has already been set and houses built! Springfield already has something better than light rail, and that is heavy rail. I would just upgrade the heavy rail to a train every 15 minutes all day. That woul allow the Ipswich trains to run express during the day. The feeder buses could be improved also. The density of Sprinfield is actually higher than what one may assume from the outset. The backyards of the houses are very much reduced so the density is higher than for some existing areas. 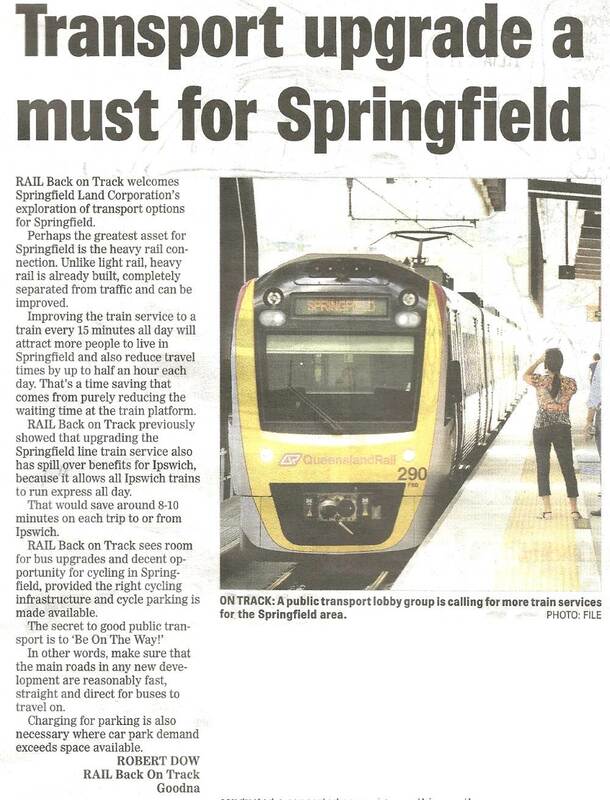 RAIL Back on Track welcomes Springfield Land Corporation's exploration of transport options for Springfield. Perhaps the greatest asset for Springfield is the heavy rail connection. Unlike Light Rail, heavy rail is already built, completely separated from traffic and can be improved. Improving the train service to a train every 15 minutes all day will attract more people to live in Springfield and also reduce travel times by up to half an hour each day. That's a time saving that comes from purely reducing the waiting time at the train platform. RAIL Back on Track previously showed that upgrading the Springfield line train service also has spill over benefits for Ipswich, because it allows all Ipswich trains to run express all day. That would save around 8-10 minutes on each trip to or from Ipswich. RAIL Back on Track sees room for bus upgrades and decent opportunity for cycling in Springfield, provided the right cycling infrastructure and cycle parking is made available. The secret to good public transport is to 'Be On The Way!'. In other words, make sure that the main roads in any new development are reasonably fast, straight and direct for buses to travel on. Charging for parking is also necessary where car park demand exceeds space available. RAIL Back on Track always welcomes discussing ideas with anyone interested in listening to our views, just contact us. The local buses are sh%t. Fix that before thinking about pipe dreams like trams in low density outer suburbs (which despite the long-run planning, Springfield very much is). High-frequency midi bus service - yes. Light rail - foam party! If a tram line were to be built in Brisbane, surely Springfield is way down on the list of priorities. I live in the Springfield CBD and heck no, the area is far to low density wise to support trams, even once Springfield is fully built. All that needs to happen is a reworking of route 522 and run those buses at least every 15mins in peak hour at a minimum rather than every 30mins as currently happens.